One of my favourite aspects of the electric guitar has always been the wide variety of string bending options that it presents. Even a basic command of bending techniques provides a very effective means of defying the chromatic restrictions that the frets would otherwise impose, presenting you with new ways to connect adjacent notes of a melody and thus allowing you to phrase in a much more 'vocal' manner. 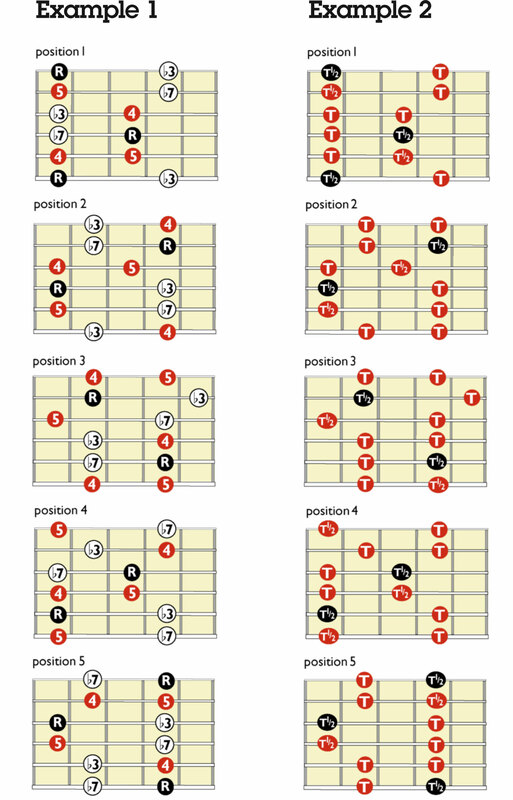 Anyone who has dabbled in blues or rock will already be familiar with some of the bestknown blues box bending clichés. So, for this first column, I thought it might be fun to begin by staying within the confines of the ubiquitous minor pentatonic scale, but applying a more systematic approach to locate all of the possible string bends therein, rather than just the handful of bends which continually crop up in the traditional canon of overused blues licks! There are two basic kinds of bending that apply to the minor pentatonic scale. One of them entails microtonal bending - ie, bending the pitch of a note less than a semitone - and I propose to start there for the simple reason that small bends hurt less! When you're using these scale shapes in a bluesy context, the b3 and b7 notes respond particularly well to being bent slightly sharp: part of becoming familiar with each scale shape thus entails remembering where these particular notes are (if instead you try to bend something such as the root note slightly sharp, catastrophe will ensue!). In terms of popular Western music, this practice of bending notes sharp only really works when your intention is to imply a certain degree of blues flavouring, so a good starting point would be to associate this kind of bend specifically with minor pentatonic fingerings, rather than trying to make it work in any other scalar contexts. Of course, one thing to bear in mind is the need to dampen the string somehow after you've bent it, so the note ends in its slightly sharpened state rather than being allowed to return to its original pitch. Failure to do this can spoil the whole effect, so it's worth experimenting with different parts of your fretting and picking hand in order to find the string-muting approach that feels the most natural and generates the least amount of handling noise. The other approach that needs to be explored here is what I sometimes like to describe as 'melodic bends', where you're raising the pitch of the note by a specific number of semitones and aiming to reach the next available note of the scale. In terms of the minor pentatonic, this means that any note is either a tone (two frets) or a tone and a half (three frets) away from the next note of the scale. Example 2 (over the page) demonstrates which kind of bend is required for each note within each position. Some of these might prove to be too painful, depending on such factors as string gauge, action and so forth. I still think it makes sense to try each of them, if only to remember which bends require an unrealistic degree of finger strength and are thus not worth attempting in a real-life playing situation. The first-finger note on the first string in position one, for instance, is a particularly nasty one… but do try using your first and second fingers together to execute this bend, before giving up on it altogether. You'll see in the accompanying video lesson that I recommend testing your familiarity with each of these bends by executing them backwards - ie, pre-bending each note up to your target pitch, then striking the note in its bent state and finally releasing it. This kind of thing can only be memorised in terms of how each bend feels and whether or not it sounds right - visually, the correct execution of the bend won't necessarily look much different from an excruciatingly out-of-tune version of the same thing, so using a backing track of some kind will definitely help you to be a more discerning judge of whether or not your guesses are accurate. The following examples, transcribed from the video lesson, illustrate some of these ideas being applied within each of the pentatonic scale positions. Good luck! This is entirely rooted in position one of our old friend, the minor pentatonic scale, and features plenty of microtonal bends. Here, we venture into Albert King territory - ie, position two - and bring in some more melodic bends. Note that the fourth note represents a way of cheating; it's easier than bending up all the way from the 8th fret, while sounding sufficiently similar. This lick illustrates how positions one and two can be connected within a single lick, using some slides. Now for some fun in position three. Don't be alarmed by the illegal-looking Eb at the start of beat 2: this is a b5, a note that is commonly added to blues licks for added flavouring. This lick mostly dwells in position four, but the bending/sliding combination in between the first and second bars offers a brief visit to the realms of position five. In a future column, we'll be examining the potential of bend/slide combinations in a little more detail, so you can think of this merely as a taster!